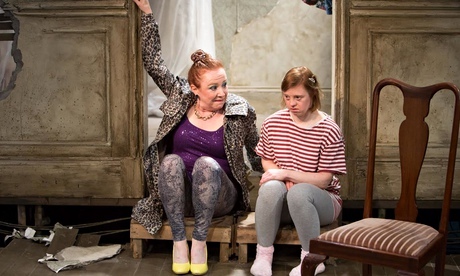 Sarah Gordy, who appears in Manchester play Crocodiles, breaks new ground by playing a character without a disability. Every actor surely dreams of making history with a role. Sarah Gordy has done so twice – in little more than a year. 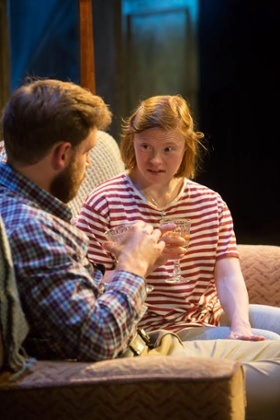 Last year the stage and screen professional, who has Down’s syndrome, became Mencap’s first celebrity ambassador with a learning disability; now she is breaking new ground by playing a character without a disability. Gordy is best known for high-profile BBC roles such as Sally Harper, a pregnant woman in Call the Midwife, and Lady Pamela Holland in Upstairs Downstairs. These performances have depicted historical attitudes to disability. However, Gordy has just finished a stint at Manchester’s Royal Exchange Theatre in Crocodiles. She portrayed a sensitive, passionate woman in a harsh, dystopian vision of the north-east of England. As Matilda in Crocodiles, Gordy played opposite actors Melanie Hill, James Atherton and Kevin Wathen. Gordy praises both cast and crew and says she was not given any special treatment. Director Ng Choon Ping, says Jane Gordy, “treated Sarah as what she is – a professional actor – he was tough on her, he was demanding”. The actor says the play’s challenges included stage fighting, fast-paced speech and complicated cues from the other actors. She prepares for roles by reading the script many times with her mother, talking about the characters and exploring why they behave as they do. “Every character I have played has a smell,” adds Gordy. For Matilda in Crocodiles, it is mint and jasmine because the character is sensitive, innocent and fastidious but lives in a rough area with crude people. “Jasmine and mint could grow on a bomb site,” she explains. Her mother adds that Gordy “lives the role”, believing everything about her character rather than acting it, a technique some might call method acting. Portraying emotional extremes is difficult, but to move smoothly between vastly different feelings, Gordy closes her eyes during set changes and pretends she is sheltered in a “safe capsule”. When she opens her eyes, she is able to feel and behave very differently. Gordy, who lives at the family home in Lewes, is also involved in local charity the Oyster Project, a volunteering group run by creative people with disabilities. She recalls how she developed a love for performing with her younger sister, Catherine: “Mum read stories and I would entertain the family by dancing and singing.” At primary school the young Gordy loved being on stage, often charged with reassuring less confident children. As well as television and stage roles – her first break was a role in the ITV series Peak Practice – Gordy performs with dance group Culture Device Dance Project. She also features in a striking portrait, After Vermeer, from 2010’s Shifting Perspectives exhibition, an annual project from the Down’s Syndrome Association. Future ambitions include playing Audrey, the goatherd in As You Like It, and portraying a woman growing older on film. Both seem attainable goals given Gordy’s achievements so far. Jane Gordy acknowledges that the arts are more inclusive than other industries. She adds that while her daughter is aware of the negative attitudes towards learning disability through her work as a Mencap ambassador, she has not experienced this herself: “The arts [are] more open. We’re looking for different, interesting unique experiences to give to the public.” Employers in other sectors, she says, must not overlook traits such as reliability, honesty and accuracy, prevalent in some people who have a learning disability. This entry was posted in Down Syndrome, English and tagged Down Syndrome, Sarah Gordy.